We went on this trip just to see what Russia was like. Overall, you spend 2 nights in St Petersburg in a 5 star hotel, 6 nights on a 5 star boat, and end in a super super 5 star hotel (we were in St Regis) in Moscow. Wow, what a trip! Nice, relaxing cruise. Not a lot to see on the cruise cause this part of Russia is very rural and not many people. Would I recommend this trip to other people? Definitely, you got to see Russia, and this is a great way to do it. Monika at Travel All Russia (TAR) was great in getting it set up for us. I would recommend going from St. Petersburg to Moscow vs the reverse direction. Primarily cause things get better as you head to Moscow and you end on a really high note in a super 5 star hotel in Moscow. We used the airline rebate and made our own plane reservations since we could get a non stop flight on Singapore Air from Houston to Moscow. We flew into Moscow, then to St Petersburg on Siberian Air (counter #106 at the Moscow airport counter). There must 150 counters so make sure you know what counter number your return airline is to make life better when you show up. Even though we made our own air reservations, TAR still met us and shuttled us to the hotel. After a 16 hr flight, that was so great and what a relief! We arrived a day early just to hit some sites, hang out on our own and shop. You start out the tour by spending two nights in a 5 star hotel in St. Petersburg. Cool. You tour the local city sites. The palaces are so beautiful. You have to hit them all. 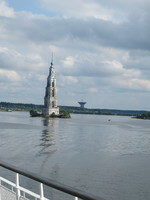 On the second day, you tour the city and a palace and end up at the Volga Dream river boat for dinner. Now this is a really 5 star river boat. It is just so nice. The crew were super service oriented. Ready to help out with anything. Now the food was something else, it was excellent and tasted great (that make sense?). Breakfast was buffet style with the chief cook making country theme omelets to order. A very wide selection of items from pastries to fresh fruit to hot items were available, as you would expect at the 5 star level. Lunch was again had an excellent selection of items with the main course meal choices changing every day and such a selection of deserts to chose from. But, Dinner now that was special. Each entrée was an art presentation. Did I say the food tasted great, well, I will say it again, and the food service was outstanding. Tables were listed by language, English, Australian, German, etc. Dinner always turned out to be such a fun time that it ran exceedingly long as we enjoyed the conversations of people from different countries. Overall, the food had numerous Russian food themes for those who want to eat the local type menus. The days cruising were filled with activities and lectures since Russia is very rural around the river route, not a lot to see. Really enjoyed the Russian history lectures from Professor Ludmilla Selezneva, a very good and energetic speaker. She took each time period starting way back and going all the way to President Putin, explained how it effected the Russian development. Since we were seeing monasteries and churches built by various Kings and Princes, it was nice to know how they fit into the Russian puzzle to enjoy what we were seeing. We also had classes on the Russian Language. I was not a very good student, only learning two words, toilet and thank you, but did learn to sing a song, well sorta. 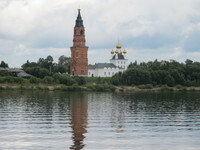 I found our stop at KirilloBelozersky Monastery was interesting in that we got to see the “lake of youth”. Washed my face in the lake but it did not help, still look old and it sure didn’t help the ducks in the lake either. They looked pretty old. My favorite city tour on the cruise was Yaroslavi City. Just a lot there to see. The guided tour of the Governor’s house was very enjoyable. Don’t want to miss that. I was not too interested in the other stops Our last night on the cruise, we entertained the rest of the passengers with our song, sure not going to win any awards. At Dinner, we danced around the tables after a vodka tasting session. Did we ever have a good time! We departed the ship on the last cruise morning for a tour of Moscow, the Kremlin and Red Square….. ending at a super 5 star hotel. We were in the St Regis. Wow. Now that is a real uptown hotel. Well naturally, it was at the Red Square! 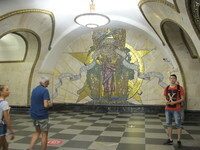 The next day consisted of continue touring the highlights of Moscow. The following morning ended a very enjoyable 5 star Russian adventure. The first night in Moscow, we were given the opportunity to see a great Russian dance show “Kostroma” listed as the Folk Show. It was a “Vegas” quality show in their main musical auditorium. That alone is something to experience. I highly recommend attending whatever Folk show is on when you are in Moscow. Notes. I would advise bringing medicine for a head cold and cough. There are no ATM machines between St Petersburg and Yaroslavl. You may not have time to utilize it. There is one computer on board with WiFi capability for free. There was free WiFi at Yaroslavl square that I logged in to send some emails. We went on this trip just to see what Russia was like. Overall, you spend 2 nights in St Petersburg in a 5 star hotel, 6 nights on a 5 star boat, and end in a super super 5 star hotel (we were in St Regis) in Moscow. Wow, what a trip! Nice, relaxing cruise. Not a lot to see on the cruise cause this part of Russia is very rural and not many people. Would I recommend this trip to other people? Definitely, you got to see Russia, and this is a great way to do it. Monika at Travel All Russia (TAR) was great in getting it set up for us. I would recommend going from St. Petersburg to Moscow vs the reverse direction. Primarily cause things get better as you head to Moscow and you end on a really high note in a super 5 star hotel in Moscow. We used the airline rebate and made our own plane reservations since we could get a non stop flight on Singapore Air from Houston to Moscow. We flew into Moscow, then to St Petersburg on Siberian Air (counter #106 at the Moscow airport counter). There must 150 counters so make sure you know what counter number your return airline is to make life better when you show up. Even though we made our own air reservations, TAR still met us and shuttled us to the hotel. After a 16 hr flight, that was so great and what a relief! We arrived a day early just to hit some sites, hang out on our own and shop. You start out the tour by spending two nights in a 5 star hotel in St. Petersburg. Cool. You tour the local city sites. The palaces are so beautiful. You have to hit them all. On the second day, you tour the city and a palace and end up at the Volga Dream river boat for dinner. Now this is a really 5 star river boat. It is just so nice. The crew were super service oriented. Ready to help out with anything. Now the food was something else, it was excellent and tasted great (that make sense?). Breakfast was buffet style with the chief cook making country theme omelets to order. A very wide selection of items from pastries to fresh fruit to hot items were available, as you would expect at the 5 star level. Lunch was again had an excellent selection of items with the main course meal choices changing every day and such a selection of deserts to chose from. But, Dinner now that was special. Each entrée was an art presentation. Did I say the food tasted great, well, I will say it again, and the food service was outstanding. Tables were listed by language, English, Australian, German, etc. Dinner always turned out to be such a fun time that it ran exceedingly long as we enjoyed the conversations of people from different countries. Overall, the food had numerous Russian food themes for those who want to eat the local type menus. The days cruising were filled with activities and lectures since Russia is very rural around the river route, not a lot to see. Really enjoyed the Russian history lectures from Professor Ludmilla Selezneva, a very good and energetic speaker. She took each time period starting way back and going all the way to President Putin, explained how it effected the Russian development. Since we were seeing monasteries and churches built by various Kings and Princes, it was nice to know how they fit into the Russian puzzle to enjoy what we were seeing. We also had classes on the Russian Language. I was not a very good student, only learning two words, toilet and thank you, but did learn to sing a song, well sorta. I found our stop at KirilloBelozersky Monastery was interesting in that we got to see the “lake of youth”. Washed my face in the lake but it did not help, still look old and it sure didn’t help the ducks in the lake either. They looked pretty old. My favorite city tour on the cruise was Yaroslavi City. Just a lot there to see. The guided tour of the Governor’s house was very enjoyable. Don’t want to miss that. Our last night on the cruise, we entertained the rest of the passengers with our song, sure not going to win any awards. At Dinner, we danced around the tables after a vodka tasting session. Did we ever have a good time! We departed the ship on the last cruise morning for a tour of Moscow, the Kremlin and Red Square….. ending at a super 5 star hotel. We were in the St Regis. Wow. Now that is a real uptown hotel. Well naturally, it was at the Red Square! 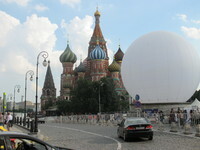 The next day consisted of continue touring the highlights of Moscow. The following morning ended a very enjoyable 5 star Russian adventure. The first night in Moscow, we were given the opportunity to see a great Russian dance show “Kostroma” listed as the Folk Show. It was a “Vegas” quality show in their main musical auditorium. That alone is something to experience. I highly recommend attending whatever Folk show is on when you are in Moscow. Notes. I would advise bringing medicine for a head cold and cough. There are no ATM machines between St Petersburg and Yaroslavl. You may not have time to utilize it. There is one computer on board with WiFi capability for free. There was free WiFi at Yaroslavl square that I logged in to send some emails. Cabin was great and nice. We got an upgrade from economy. We had 4 large square window. May not sound like much but it is a big deal, compared to one round port hole. The room was about twice as long as the bed. That is big. Really nice with all that room even though we never spend time in the room.